Our Protective Wall Panels and Strips are rigid vinyl sheets that wall protects in a broad range of uses, from corridor wainscot and patient room walls, to back-of-house areas and slop sink backsplashes. Or it can simply be used as a finishing touch to complete a unified presentation in wall protection system designs. From the thinnest .040" gauge to our indestructible .090" sheet, used at wainscot height or full wall height. Thickness - / Thin .040" / Med-Thin .060" / Medium .080" / Thick .090"
Call for custom colors/sizes 888-355-6287. Quick ship available for Thin and Med-Thin Wall Panels in ivory, tan, champagne, eggshell, silver gray, teal, linen white, and windsor blue. All other styles and colors may be 4-week lead time. Ideal for healthcare, childcare, elder care facilities, universities, casinos, offices. Ideal for walls, doors, and cabinetry. Recommended adhesive ADH-60 mastic adhesive or 3M™ Fastbond 30 contact adhesive or equivalent. I'm looking for wall protection for my church. Our walls are getting quite scuffed from tables and chairs. Will these strips get marked up like a wall does? Would the scuff marks wash off? Thank you. Is it necessary for this product to pass the ASTM E84 flame and smoke spread test? I am looking at Chair rail- Vinyl strips with the self adhesive tape. My question is how thick is the tape and how far off of the wall will the strips sit when adhered to the wall? Thanks. can the thin rub rails be bent around a corner? Are the chair rail -Vinyl Strips #A829 Paintable?? Hi, I am interested in the Vinyl strips/Chair Rail Item # A829. I would like to know if you can cut the length and if so, what tools would be needed for that? Hello - I'd like to purchase one 8" x 8' Rub Rail Thin (.040")in Blue Bird color but I can only see where it can be ordered in sets of three. Is there a way I can order just one? And if so how much would that be? Hello, I'm interested in product #A829. Can I get samples of the vinyl strips in the different thickness? Are the colors listed on the website close to the actual products? Do you have a sampler kit for the colors? Thank you. What is the installation process, this is the first time I will install something like this as part of my duties as a facilities specialist at the company I work for, so any help I get will be greatly appreciated. Thank you. Hello, I am a return customer. Currently, my site is beginning to update our conference rooms. I am interested in your product (Chair Rail Ideas | Vinyl Strips and Sheets - #A829). I would like to match various existing fabrics, wall colors, etc. Can you provide samples? Please let me know. I am just a person, not a company. I'm in a wheelchair. All of the corners in my home have those rounded drywall corners. Naturally I bump into them. I have been searching for corner guards for years for these rounded corners in certain spots. Do you suppose your A829 in 0.04 thickness would wrap around and provide the abrasion or bump protection I need? And what is the last item in the cost listing on that page? It just says 8' wide, fits 0.04 (among others) $8.61 each. Are any of the colors paintable? Thank you. 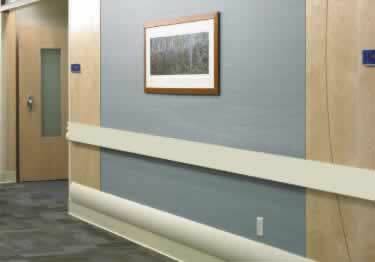 Protective Wall Panels and Strips are rigid vinyl sheets that protects walls, comes in a broad range of uses, from corridor wainscot and patient room walls, to back-of-house areas and slop sink backslashes and 60 colors to choose from. Very durable product. Works great to keep your walls from getting scuffed up. Highly recommended. Thank you for your review. We appreciate your feedback and kind words about our product's durability. We have a high traffic area where the wall was continually damaged. We put up the 8' vinyl strip at the high of the damage and problem solved! The product looked nice, easy to install. What I didn't like was the cuts. Created burs on the edges. You could tell when you got the top and bottom strip from the panel because it was smooth. Wish all strips could be smooth like that. Our new clinic had exam room chairs gouging the walls! These were the perfect solution. Easy to mount and look very nice. Website is easy to find products and the prices are great! coupon code for your next order. Its Great! I always use on my next order. The idea behind the panels was a great idea and the ease of installment was nice to experience. This product gave a great all around look to the room and offers needed protection. I loved it! It was easy to work with, easy to apply and looks great. The customer service was fantastic. I would highly recommend both the product and company to anyone. Web site easy to navigate. My credit card had an issue and they promptly contacted me. Order went out that day. Adhesive for applying Wall Covering Wall Strips and vinyl corner guards.